The existing body of literature and the results from faculty/staff and student surveys reveal that a focus on effective communication strategies at the University of West Alabama would greatly benefit UWA students in their personal and professional lives. The survey results and the literature recognize that the field of communication is rapidly changing. Digital technologies allow individuals to communicate with one another more rapidly, enable interactive feedback from a large audience, and continue to expand methods through which individuals communicate. While there are advantages to these advances, they have also negatively influenced the communication skills of many students at UWA. The boundaries and “rules” that define appropriate communication have become blurred by text-speak and social media, the ability to communicate appropriately and effectively using all media modes has become more challenging, and the skills of media literacy have been weakened, causing students to struggle with analyzing and critiquing existing media messages. Through the lengthy QEP development process, UWA faculty and staff decided to turn to tried-and-true communication strategies to guide the Quality Enhancement Plan (QEP). The concepts of persona, audience, tone, style and occasion are all key elements in appropriate and effective communication, but are noticeably neglected in many communication attempts by students. From e-mail to essay, UWA students frequently struggle with these concepts. Therefore, UWA anticipates that the iCommunicate: Translating Effective Communication Strategies Across Multi-Media Platforms QEP will help students translate traditional communication concepts across academic disciplines and multiple media modes. Effective communication and message analysis are key elements in life, both personally and professionally; therefore, UWA believes it is important that iCommunicate be successfully implemented in a variety of academic disciplines to benefit students in their personal and professional communication decisions. UWA students will benefit from the knowledge of how to adapt effective communication strategies to all forms of communication; they will be prepared to communicate effectively for a vast majority of professions; they will gain skills in media literacy and message analysis, thus enabling them to be more informed and responsible citizens; and they will be better prepared to apply these sound concepts to new forms of communication that may arise in the future. The University of West Alabama QEP is designed to help students translate traditional communication strategies (including persona, audience, tone, style, and occasion) across a variety of media platforms. In today’s media savvy world, students must navigate a wide variety of media modes and have an understanding of how each of these modes functions in society. As media modes continue to multiply and evolve, it is important that educators teach students to apply traditional rhetorical techniques to all interactions, whether personal or professional. The QEP focus is on creating and interpreting messages appropriately for any occasion. The following SLOs will be used to assess student learning and the overall success of the QEP. Assessment data will be collected and measured using two methods. First, data from a QEP group and a control group will be collected for the two courses included in the twelve-month pilot program, English Composition I and Biology I, which are both freshman-level courses in the UWA core curriculum. Data collected from these courses will also serve as baseline assessment data for additional assessments in the third through fifth year of the implementation process, when higher-level courses will be used to assess students. An assessment system that is transparent and beneficial for the academic programs in the process of continuous program improvement. The completion of an iCommunicate quiz, tailored to the particular course. Necessary resources to complete the iCommunicate QEP include new and existing funds. New funds are estimated to total $151,800 over the five-year timeline or an average of $30,360 per year. Items identified as new funds include QEP personnel, QEP faculty stipends, professional development, supporting activities, and promotional materials. Items identified as in-kind funds include facilities, operation and administration costs, and web design and management. The in-kind funds average $49,097 per year over the five-year timeline. Therefore, the total cost of the QEP is $397,285 or an average of $79,457 per year. The following timeline represents the progression of events of UWA’s QEP. The events move from the development of the QEP and the implementation pilot study in Fall 2013 through the completion of the QEP in Spring 2018. UWA will use a prospective design to assess the effectiveness of the QEP in relation to the established SLOs. The first year of the plan will be used as a twelve-month pilot program to tweak assessment tools and classroom strategies. 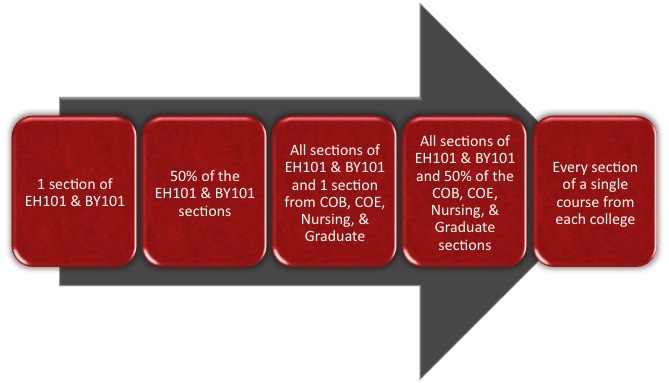 As the following figure shows, only one section of EH 101 and BY 101 will be used in the first year to implement the QEP. Simultaneously, control group sections of EH 101 and BY 101 that will not be exposed to the QEP course content will also be used. Comparisons between these two groups will be used to improve the QEP in years two through five. Control groups will be used in years one through four. No control group will be used in year five because every section of each designated course will be taught as a QEP course at that time. In summary, sound plans for implementation, sustainability, organizational structure, and assessment have been made for the iCommunicate QEP. Anticipated results are aimed at exposing students to a wide array of media messages, preparing them to present an appropriate persona, tone, and style in all communications, increasing student interest and participation in the classroom, and preparing them for effective communication in their personal and professional lives. During the next several years, UWA hopes to help students achieve greater academic and personal success through the benefits gained from the proposed Quality Enhancement Plan.